Sixteen entrepreneurs from ten countries toured Silicon Valley, New York, Boston and Washington, DC with US Department of State sponsorship to promote and develop their startup ventures. The delegation’s Boston/Cambridge itinerary was organized by Cambridge Advisors in conjunction with CRDF Global, the Washington, DC area non-profit foundation that operates the Global Innovation through Science and Technology (GIST) initiative on behalf of the US Department of State. The “GIST Journey” provided entrepreneurs the opportunity to integrate with the US entrepreneurial ecosystem in major centers of innovation. 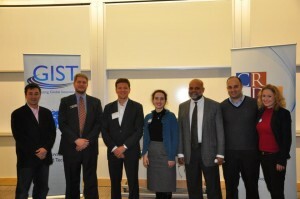 While promoting their own startups, the entrepreneurs received valuable guidance from mentors, peers, attorneys, and investors interested in supporting their ventures.The Boston/Cambridge leg of their journey included two days of intensive business meetings, workshops, tours, mentoring and networking sessions. The participants received sales training, attended workshops on intellectual property and strategies for developing countries by local firms and professionals. Networking events were held at MIT and Harvard with local alumni, graduate students and faculty interested in innovation, entrepreneurship and economic development. Professor of Practice and Executive Director of the MIT Legatum Center, Iqbal Quadir gave a keynote address to an audience of 100 participants and attendees at a networking reception hosted at the MIT Sloan School of Management in honor of the delegation. Cambridge Advisors is a global consultancy that specializes in developing integrated strategies to foster economic prosperity. As part of its comprehensive service offerings, Cambridge Advisors provides its clients with customized, highly impactful capacity building and study tours as complementary services to support client objectives.